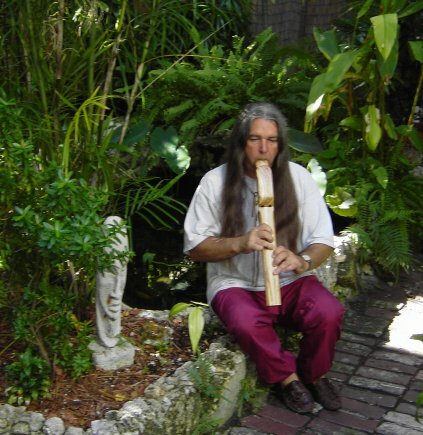 He is playing a Medium Size Flute tuned to the key of A and made from Aromatic Cedar. "Thank You for taking the time to invite me into your day. Music is an ancient way to alter our consciousness and communicate with all our relations. It is used for meditation, healing, and therapy. The flute is always a spiritual experience for both me, the maker, and you the player. The flute is more than a wooden musical instrument. To play the flute, you must breathe with the flute. I've had people say it's just like Yoga. I am honored that my path has led me to be a maker of these wonderful instruments. I would love the opportunity to create a flute for you. I am a native Virginian. I was born in Roanoke, VA. I was adopted at birth. My adopted mother told me that she met my birth mother several times and that she was eastern cherokee. I have tried to access the adoption records, to no avail. I am not a member of a federally-recognized Indian tribe. I am of cherokee descent. I always felt like I didn't quite fit in. I turned to music at an early age. I began playing bass, guitar, and harmonica. I played on the road, nationally throughout the US during the 70's. I have always had a passion for working with wood. I've built custom cabinets, collapsible drum stages and speaker cabinets. In the 90's my oldest son joined the band and we were ready to go back on the road again with our music. Then tragedy struck , Jeremy's son, Lucas, was diagnosed with Leukemia. Life stopped. We put everything on hold and waited. In the following year we were blessed with a miracle. We found out that Jeremy's second son, Andrew, was a perfect match bone marrow donor and, now, my grandson is better. He's living a normal life today. It's funny how life sometimes guides you in different directions. During this time we still had band contracts to fill. Numerous personnel changes in the band led us to a guitar player by the name of Steve Bartha. The second practice he brought his Native American Flutes. For me, it was love at first sound. I knew this was my calling. It was a perfect match between my musical gift and my wood working gift. Now, years later, from our home and workshop in the peaceful woods by the spectacular Stockton Lake in Missouri, we make and sell flutes all over the world." Jerry is playing a large Drone Flute made from Zebrawood. 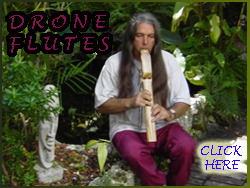 Drones are flutes that have two voices. You play your melody and the second voice accompanies you producing a surreal experience. My two greatest joys are: Teaching someone to play flute and knowing that my music has touched someone. Whether you play Native American Flute or listen to the flute, my goal is to have you experience flying. For me, playing the flute lets me fly. Listen to our recent CD entitled Glidin' in the Updraft and you'll feel what I mean by flying. Music has played a tremendous role all throughout my life. All of my memories are attached to whatever song I was listening to at the time. The songs I write are inspired by my personal experiences. For instance: Myanmar Terra, off of our 3rd CD was written because of the way I felt when viewing the video's of the devastation in Myanmar(Burma). My grandfather was adopted into the Assiniboin Tribe, but I am not a member of a federally-recognized tribe. The Native American Flute is the only melodic wind instrument belonging to the People of this continent and the only instrument indigenous exclusively to the United States. 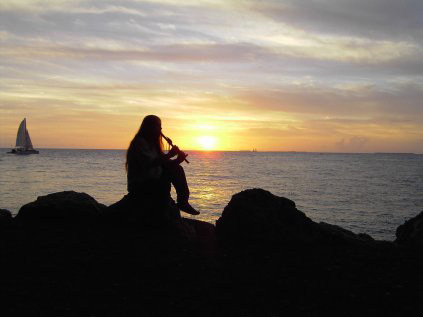 The Native American flute, while not common among all Nations, did indeed stretch from the west to the east. Indian Love Flutes have always been an important part of Native American culture. Indian flutes are known for being made from aromatic cedar and other woods indigenous to the area that they were made in. you the power and all things necessary to do what you have been called to do. What have you been called to do? Why Do We Make Flutes? THANKS! I have no words for your treasure. I feel like a child!!. The flute sounds like heaven!! Today arrive at home. I attached the picture that we just did. She is Esther my wife and singer. ...I hope that you understand my poor english, jajaja... I will try to rec something interesting with your/our winded treasure. with Karen Sperling playing her Fretwell Flutes. We are proud to be sponsors of the Talequah Native American Flute Circle and the Tsalagi Flute Youth Ensemble located in Tahlequah, Oklahoma. In the picture above, they are playing the special flutes we built for them. They are tuned to the same pitch (Key of C) and play in perfect harmony with each other.. If this is your first flute, look at the size of their hands holding their flute. Look at how far they stretch their fingers to play the flute. This will help you decide which size flute is best for you. Now Playing: " Ulisi's Lullaby "
A lullaby written for my grandson, Eli. If you are using your Phone or an Android, listen with SoundCloud. If you are using your PC, listen with SoundClick. Download our music for Free. We do not use PVC to make flutes. Do not purchase a flute made from PVC. PVC is a hazard to your health. Click Here to learn about PVC (Polyvinyl chloride). "If only this would happen, then,,, I could do it."